Take a ride in the Space Age℠A ride! Your kiddos can cruise through the air on a space mission in these futuristic starships. 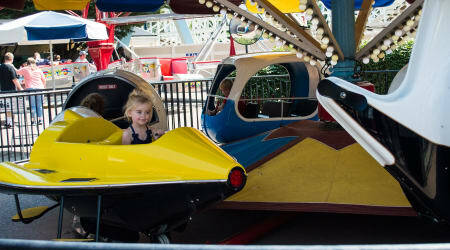 Space Age is located in the Founder's Way℠A region of Hersheypark®. One taller companion may accompany each child: that includes mom or dad. This ride only seats four guests taller than the Hershey's milk chocolate bars height category and they must sit in the red or blue spaceships.